Pouch Making Machine For Three Side Seal Bag / Stand-Up Pouch / Zipper Pouch / Four Side Seal Bag(FTSC-V) - HCI Converting Equipment Co., Ltd.
Main drive servo motor: The operator can change the feeding and sealing time for each material independently. Sealing temperature adjustment unnecessary while machine speed up. 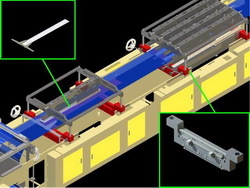 This mechanism can help to reduce the lost of material greatly. Feeding servo motor*2: The pouch length is accurately controlled by servo motor includes middle pulling stand and rear pulling stand for upgrading production speed. The new FTSC-V pouch making machine can give about 30% more productivity than conventional bag making machines. One machine can produce various pouches such as three side sealing bag, stand up pouch, bottom gusseted stand up pouch, zipper pouch, combined stand up and zipper pouch. 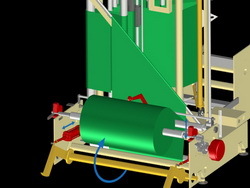 3-side sealing bag: 3 lanes production and the skip seal function can reach 9 times of feeding length. (max.1,200mm). Stand up pouch and zipper pouch: 2 lanes production. Bottom gusseted stand up pouch & Four side seal bag: Dual function unwind stand and a second add-on gusseting device are optional items that facilitate production of standup pouch with bottom gusset and four side seal bag. The adjustable gusseting depth, together with the gusset-nipping roller and photocell features, accurate gusset depth and precise sealing position can be achieved without film slip problem. The film takes many processes to convert to a pouch of demand size and shape. Most of the process are forming (folding and/or gusset forming), sealing in longitudinal and transverse directions, inserting other substrates such as zipper and gusset. Appropriate tension control is important to the composing process. The new FTSC-V Pouch Making Machine can set different tension values for each special tension zone to ensure the precise performance during pouch making machine running. Unwinding and forming zone: including unwind buffer roller unit and center partition buffer roller unit, the operator can use different buffer roller unit according to pouch shape. 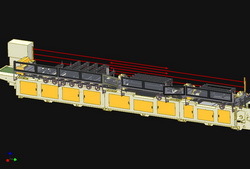 Each buffer roller unit is using the VR (Variable resistor) for auto speed varied and assures that the most stable web feeding even under high speed operation. Zipper / gusset inserting and zipper pouch sealing zone: The film enters into intermittent path from this zone. 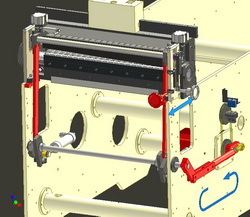 The zipper inserting tension is controlled by motor incorporated buffer roller unit in order to cope with the rush pulling that cause by intermittent path. Side sealing zone: The film is sealed longitudinally in this zone. And the tension is adjusted by the rear pulling stand which driven by servo motor and micro location offset via dancing roller control system. Bottom sealing zone: The film is sealed transversely in this zone. Therefore to avoid stretch in sealed area is the prime need. 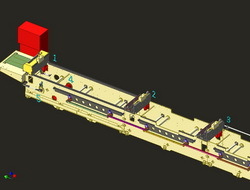 Through the middle pulling stand and micro location offset via dancing roller control system maintaining the minimum tension. Horizontal unwind stand and 3" air shaft incorporate with pneumatic loading device. Single operator is required to load the parent roll. The adjustment is accurately controlled by servo motor incorporated with a contrast scanner. This device can eliminate the printing variations between upper and lower films automatically and reduce the defecting bags greatly. 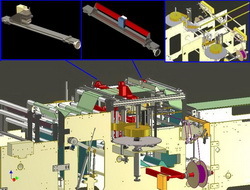 The movement of new dancing roller unit is controlled by two separate air pressure cylinders. According to the setting value, the system will detect and adjust the tension via change the feeding length of servo motor automatically. 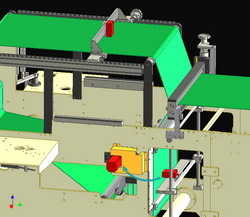 It is designed to provide the most stable tension during pouch making machine running. The latest development of zipper pouch sealer and side sealer auto descending device which can prevent the material been overheated or broken when machine stop. HCI zipper guiding and cooling plate (Patent No.178721): This plate can steady the sealing position of zipper and the cooling circulation system can prevent the zipper pouch been overheated. Ultrasonic sealing device: it can weld the zipper rib in advance before entering the bottom sealer. The bottom sealed position will be flatted and perfected without leakage problem. Microprocessor PID temperature controllers work with SSR (solid state relay). The system can process once communication control in 2 seconds and provide the most accurate and fastest heating performance. 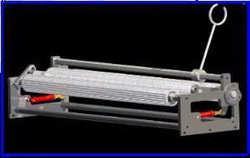 Cutter servo motor control system: The cutting speed is variable and the double cut function can eliminates burrs on in-line corner or notch puncher. This function improves the products quality. 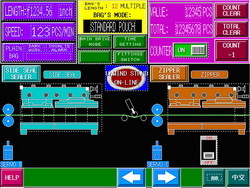 The automation man-machine system collocates with high-quality MES mechanical and electrical integrated controller. LCD colorful touch screen; Simple figure display for setting and easy operation. Speed varies with heating extended time suitable for thicker film. Various bags modes setting: standard pouch/ multi-seal with single cut / skip-seal / double cut. Both side printed film adjusting device.